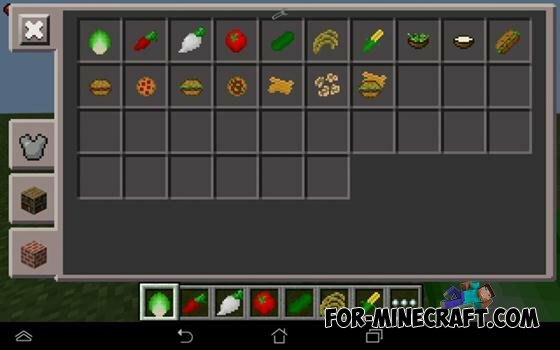 Agriculture mod adds 7 new vegetables in the game that can be planted and then grow into complete plants, which can then be collected. In addition to new opportunities for agriculture is also an opportunity to create new dishes such as salad, popcorn, rice soup and vegetarian pizza. All recipes originate with new freshly picked vegetables. How to get the vegetables and put them? Find and cut some grass to find vegetables. When you have them, you can go to the table crafting and turn them into seeds. Seeds can be planted in agricultural blocks. When the plant looks completely ripe, it is time to harvest. Just hit him with his fist, to remove it, and then get to collect vegetables and seeds.